Starting a startup is kind of crazy, it is a really irrational decision one that I encourage you all to make. 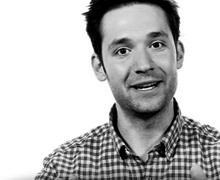 Alexis Ohanian is the co-founder of Reddit, BreadPig, and HipMunk. As the founder of two immensely successful startups, and the head marketing guy at the third, Alexis knows a lot about what it takes to run a successful startup. He and Reddit co-founder Steve Huffman are graduates of the Y-Combinator program, (a seed stage venture firm that invests in startups), and he now brings his insight to General Assembly‘s new online program, the Fundamentals of Entrepreneurship, in his class Make Something You Love. The class starts out with a lesson learned from Y-Combinator‘s motto: “You have no chance of making something people love if you haven’t already made something people want.” Alexis presents a few ways to make something people love, we’re going to highlight three: focus on the users, champion good design, and give a damn. In 2005, Alexis started Reddit, a social news site, in his apartment with his friend Steve. Six years later, Reddit is now one of the most trafficked websites on the internet and receives around 35 million unique visitors and 2 billion page views a month. Reddit users love the site’s community, they engage with it, create content, and truly make the site what it has become today. Alexis said, “This didn’t happen because we convinced people that this was something that they should love. We didn’t need to promote the idea that they should love it, we just focused on building something they should love. About 80% of all the traffic (of all the content) that is created on Reddit is generated by 20% of their user base: a devoted group of passionate users. Alexis and Steve wanted Reddit to the best engine for community creation online, and to do that they made it a community that the users love, and want to contribute to. A lesson learned from the success of Alexis’ user-driven sites—treat your users well and put the users first. Alexis says, “Everyone talks about putting users first. Don’t talk about it. Don’t market it. Just do it.” This principle has certainly paid off for both Alexis, and Reddit’s dedicated community. If you start something, care about it. Give a damn. Alexis urges us not to underestimate the role of founders. He says, “Understand that it starts with the founders. It means that founders have to give a damn. In fact, they have to give lots of damns, they have to give more damns than anyone else because it sets the precedent for the rest of the company.” He believes it’s this focus, this courage to take risks, to take chances, to fail and start over, that gives startup founders the greatest advantage. We strongly encourage you to take the Fundamentals of Entrepreneurship classes. Watch the videos (they’re broken down into segments to make them more manageable), check-out the resources, and join the class discussion with other attendees live as you watch. Don’t get left behind. Get started today. Keep learning new skills (classes like these help), and just think about what you can make that will make you happy. Often times designing around ideas you are passionate about, creates products others are passionate about too. Alexis knows first-hand that starting a startup is kind of crazy. He says, “It is a really irrational decision, one that I encourage you all to make.” Y-Combinator just announced yesterday that they now accept applicants without an idea. They realized that many of the startups they accept change their idea completely, and some of those do really well. They cited one successful idea evolution as none-other then Reddit, which “was originally going to be a way to order food on your cellphone (a viable idea now, but it wasn’t before smartphones).” Ok, so Alexis and Steven had two really great ideas…but even if you don’t have that great idea yet, you will. Just take note of the problems in your daily lives, and be open to change if one idea isn’t taking shape. Just keep pushing forward. We’re applying today. Will you?